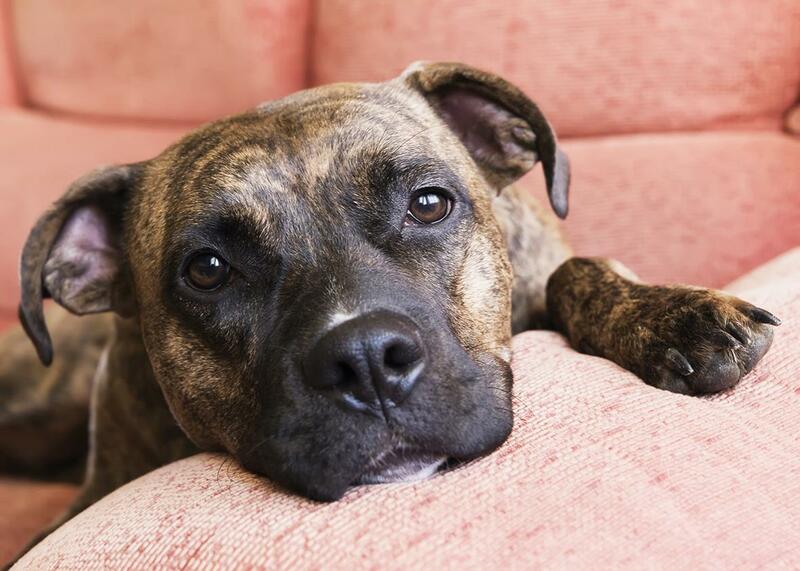 Montreal wants to ban pit bulls but has no evidence it will help. The evidence for such laws is lacking, yet Canada is still trying to implement outrageous regulations against this breed. A proposed ban on pit bulls would technically grandfather existing pets in, but even owners who follow all the guidelines may not be able to keep their dogs safe. Update, Sept. 27, 2016, 5:13 p.m.: On Tuesday afternoon, Montreal’s city council passed this deeply flawed piece of legislation by a 37–23 vote. A spokesperson for the SPCA Montreal tells Slate that this law goes into effect on Monday, Oct. 3. Mireille has spent 26 years in the Montreal home she fixed up herself. But now she’s considering moving to another part of the country with her two adopted dogs, mutts named Danke and Julius, because Danke and Julius may no longer be welcome in her city. Montreal is considering a law that would ban pit bulls, supported by its mayor, following the death of a woman in June at the hands of a suspected pit bull. If labeled pit bulls under the law, Mireille’s dogs (we’ve withheld her last name) would technically be grandfathered into the city and allowed to stay as long as they acquired the right permits and abided by certain regulations, the resolution would make them extremely vulnerable to seizure and forced euthanasia. The law—known as breed-specific legislation or BSL—was proposed in the wake of a horrific attack this past June. Montreal resident Christiane Vadnais was found dead after being attacked by a neighbor’s dog who had entered her own backyard. Soon thereafter, Montreal Mayor Denis Coderre announced he’d be seeking to pass and implement a new dog law targeting “dangerous breeds,” including pit bulls. The killing was terrifying and by all means should be prevented if at all possible. But the law Coderre is supporting is flawed to the point that if it is passed, there is little evidence it would have the desired effect on these possible events. More fundamentally, every reputable group that has examined the issue condemns breed-based dog laws, including the American Bar Association, the American Veterinary Society of Animal Behavior, the American Veterinary Medical Association, the United Kennel Club, and the American Kennel Club. Even the White House has come out against these types of bans, stating that “research shows that bans on certain types of dogs are largely ineffective and often a waste of public resources,” in a response to a petition against breed-specific legislation. The White House’s statement goes on to suggest that a “community-based approach to prevent dog bites” is a better alternative. This approach involves figuring out the dog-related problems specific to a given community, and asking local organizations and groups to help be a part of solving these problems. Indeed, the breed-specific laws have never been found to make people safer. Instead, to the contrary, dog bites have gone up in the wake of implementation in certain places—such as in Ireland, Sioux City in Iowa, and Toronto—perhaps because the law creates the false belief that all other dogs will not bite, which in turn leads to unsafe behavior. These laws are also costly, with animal control and law enforcement officers charged with enforcement, shelters required to house seized animals, and inevitable lawsuits that ensue. Bronwen Dickey, author of Pit Bull: The Battle Over an American Icon, thinks single-breed laws are contrary to scientific evidence and counterproductive. “If anything, they jeopardize [public safety] because they divert animal control resources away from truly dangerous individual dogs and use it to round up dogs who haven’t harmed anyone,” she says. This is why community after community in the United States is rejecting these laws in favor of breed-neutral dog regulations that focus on owner responsibility and address safety without mistakenly and incorrectly blaming all attacks on a specific dog breed. Still, some parts of Canada have gone in the opposite direction. Québec City’s mayor came under fire this summer when he proposed that dog owners had until January to “get rid of” their pit bulls. After an outcry, this plan was scrapped. Québec province—which Québec City and Montreal are both part of—has not yet rejected a ban, though an advisory committee has recommended a different approach. Affected dogs include purebred American pit bull terriers, American Staffordshire terriers, and Staffordshire bull terriers—and those who are just partly one of those terrier breeds. Dogs who merely look like these types, with the squarish heads and muscular bodies, are also included. The Society for the Prevention of Cruelty to Animals Montreal is fighting to defeat the measure, but it has also announced it will no longer provide dog services in Montreal. That’s because the law would, in effect, require healthy, otherwise-adoptable animals to be euthanized based upon nothing but their looks. About one-third of the 2,000 dogs the SPCA Montreal takes in every year could be considered pit bulls under this law. If it goes through, they may never find a home. But in the days before the expected vote, Alanna Devine, director of animal advocacy at SPCA Montreal, says she’s seen something rather remarkable: People coming to the shelter asking to adopt pit bulls, to try and make sure these dogs get adopted while it is still a legal option. “They’ll get grandfathered in,” she says.